The Department of English language was established in the first year of the establishment of the university in 1991. The following year witnessed the establishment of the Faculty of Arts and Human Sciences and it was titled the Faculty of Languages and translation. In 1996, the Department of English Languages opened its first diploma is Translation to meet the urgent need of the Gaza Strip for professional translators. Furthermore, in 1997, the English Language Department opened a new major of English French to meet the needs of some businesses, foundations and non-governmental organizations for French speaking workers. 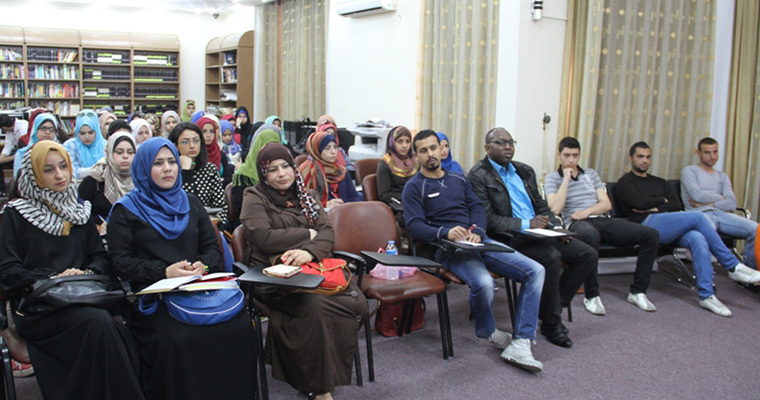 The Department of English Language aims to rehabilitate students to work in the areas of teaching English at schools, colleges, and translation. Furthermore, it strives to develop their language abilities so that they can cope with the developments in various fields, especially communications, trade and business and management. To develop students' performance in the English and French languages to enable them to use the language professionally, whether in education, such as schools, universities and institutes or entrepreneurial institutions such as banks, companies, factories, and institutions. To supply the Palestinian markets with specialists in English and French. To develop the performance of employees by providing an appropriate environment for research by opening an electronic library for students and researchers as well as providing the university library with a number of books and references that benefit students and researchers.